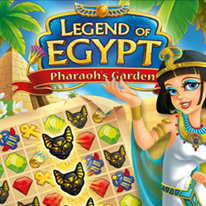 Build a Garden, even more beautiful than before, on the edge of the Nile for Pharaoh's daughter! Using the artifact of life, the gods created wonderful gardens in Egyptian land. After the disappearance of the artifact, the gardens withered and fell to dust. Build a new park, even more beautiful than before, on the edge of the Nile for Pharaoh's daughter. Earn bonuses and trophies to expand the park and create flowering gardens, fountains, sculptures, obelisks and pavilions. A challenging match 3 adventure, trophies and a gripping story await you!